A lot of times I get odd cravings, such as pickles, beets, asparagus, etc etc. I will admit though most of my cravings are actually good for me. It helps me broaden my food likes. ( I'm not preggers either, I'm just weird is all lol) I always hated mustard but I beleive it was in 06 I had craving for Polska kielbasa with sour kraut and mustard, lol I thought I lost it but success I eat mustard which is healthier then mayo, even though I still love mayo, and sour kraut now! :) I know it's silly but last night I got grumpy cuz I wanted cheese balls thanks to Go On, it's an awesome show on NBC, they talked about grief eating, and one of the characters said she ate cheese. :/ so yeah I wanted cheese balls cheese cubes lol I just get this way I hate it lol. I am scared when I so finally get preggers how am I going to be then, sheesh. 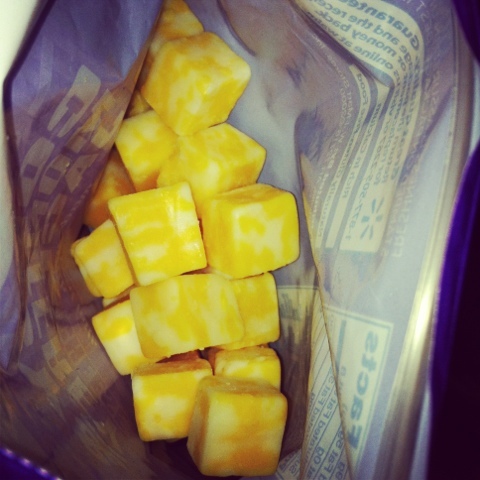 Oh well, so anyways I give you cheese cubes nom!! Enough with cravings! Ta Ta For Now!